Presented as a gift by my sister, this beautifully structured S. trifasciata ‘Laurentii’ has been in our garden since early year 2005! But of course it was scanty then and less than a foot high. Needing the least care, it has grown remarkably well through the years, adding so many offsets freely that we’re surprised its pot is still intact and unbroken! 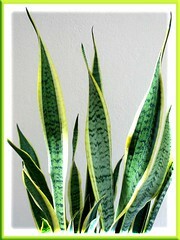 Common Name: Goldband Sansevieria, Variegated Snake Plant, Mother-in-law’s tongue, Viper’s Bowstring Hemp, Good Luck Plant. Propagation: By division of rhizomes at anytime of the year or from leaf cuttings, though the latter method will not produce true offshoots with yellow marginal stripes like the parent plant. Propagate by division to obtain the yellow variegation. Features: It has stiff, upright, swordlike and spine-tipped leaves that grow from 1.5 to 4 feet long, which led it to be nicknamed ‘Mother-in-law’s tongue (LOL! How unkind!). The leaves have variable width, widest about 2.75 inches, and can be flat, slightly twisted or folded. Leaves have attractive golden yellow margins with variable width and position, and with a deep green and light grey-green cross-banded center, similar to a snake’s skin, thus commonly named ‘Snake Plant’. The fragrant flowers are greenish-white on an 18 inches spike, blossoming in the hot season, though rarely. Sansevieria trifasciata ‘Laurentii’ has been and is still by far the most popular ornamental sansevieria, though ‘Golden Hahnii’, a fabulous birdnest sansevieria that is a sport of ‘Laurentii’ is also fast catching up in popularity. 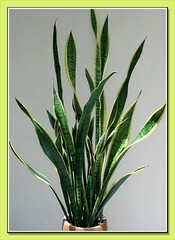 Care: Sansevieria is absolutely an easy to grow plant that thrives on neglect. Tough and durable to a wide range of conditions. It is as easily grown whether on ground outdoors or in containers indoors. Fertilize only once during the growing seasons with a slow-release fertilizer. Repotting should be done only when necessary, probably when the tightly-packed, strong underground rhizomes breaks the pot or the need to propagate arises. No known plant diseases or pests. For temperate regions: Hardiness: USDA Zone 9 and higher. To know more about sansevieria’s culture, refer to fact sheet by International Sansevieria Society. Hi. I hope to get more information about sansevieria trifasciata ‘Laurentii’. Hope to get the good news from you. Thanks you. Kindly disclose what sort of information are you seeking? I hope to know the environment factor included chemical and physical factors that can influence the growth of ‘Laurentii’. Thanks. Good to know you have such a fine specimen! For some reason this plant is not easy to buy in lush, good condition any more – on a recent trip to Sungai Buloh, I saw only 4-5 really good plants. One of the nursery owners said that their stocks were being depleted by disease. So we should treasure the good ones we have!